The devotion to the Sacred Heart is one of the most widely practiced and well-known Roman Catholic devotions, taking Jesus Christ’s physical heart as the representation of his divine love for humanity. It is celebrated as the feast day for men named Jesus (as Christmas is reserved to honor Jesus’ birth). The origin of this devotion in its modern form is derived from a French nun, Saint Margaret Mary, who said she learned the devotion from Jesus during a series of apparitions in the mid 1670s. Two hundred years later a Portuguese nun, Blessed Mary of the Divine Heart (a former Countess) reported similar apparitions. 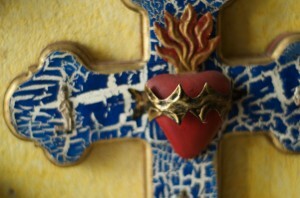 The Sacred Heart is shown as a flaming heart (representing love) encircled by the crown of thorns. Veneration of the Sacred Heart promises a happier life and easier death, and promotes receiving communion the first Friday of every month. Images of the Sacred Heart are nearly everywhere in San Miguel and in a wide variety of styles. 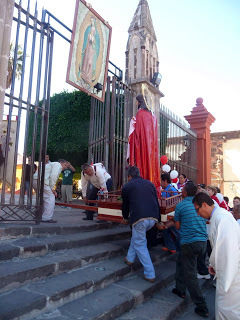 The statue featuring Jesus and his Sacred Heart is paraded around town and led into the Parroquia each year.